Iris Evelyn Wacher peacefully slipped away in the late hours of June 28th 2018, one day after her 93rd birthday. Iris was born at RIH Kamloops BC on June 27, 1925. Iris is survived by her son Ted of Nanaimo, Donnie of Kamloops, daughters Lynn (Gary) Forgaard of Kamloops and Leslie (Buzz) Dean of Kamloops. Iris was predeceased by her husband and true love Alvin on Aug 5, 1979 as well as brothers Jack and Bill and sister Jessie. 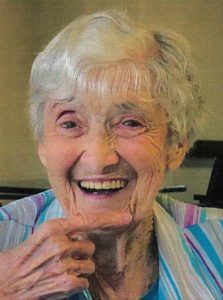 Iris lived a wonderful and full life surrounded by 12 grandchildren, 25 great grandchildren and 3 great great grandchildren. Iris will be so dearly missed by all her family and friends. A celebration of life will be held at The Hamlets in Westsyde on Aug 11, 2018 from 1 til 4. Should you so desire donations in her memory to Big Little Science Centre in Kamloops or the Kamloops BCSPCA. Drake Cremation & Funeral Services in charge of arrangements. We will miss you Gram. Leslie, Lynn, Don, and Ted…so very to hear about auntie Iris’s passing. I have so many great memories of the kind, gentle and loving person that she was. Take good care of each other.